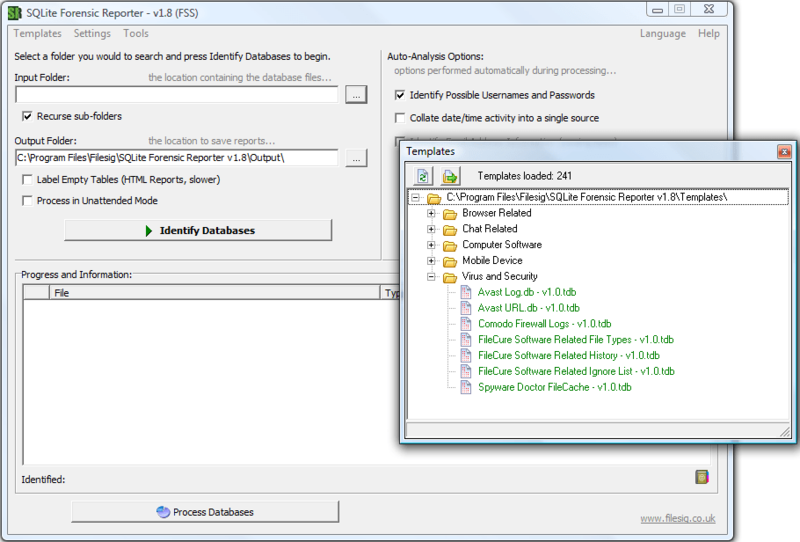 A new version of SQLite Forensic Reporter, Universal SQLite database examination tool is available, version 1.8 now includes more features to analyse, extract and report on information from any SQLite database (not corrupted or encrypted). Added: templates now include a BLOB analysis section to deal with the automatic extraction of embedded data within database files. Added: File Signature Analysis database has been added to manage both preset and user added file signatures. The file signature analysis is performed across the embedded BLOB data to determine the file type and rename file extension accordingly. Added: HTML reports generated from a template will contain hyperlinks to any exported embedded BLOB data. Added: File Signature utilities added to convert text to hex and to extract possible file header from selected file. Added: a new log file “SQLite FR User Settings Log.txt” which contains a copy of the user settings at the time of Processing. You are currently browsing the Filesig Software / Simple Carver Suite blog archives for September, 2012.